Commentary: "...today's guidelines are consistently serving the financial needs of the custodial parent where it should serve the children's needs to be with both parents." The Minnesota Legislature appears close to overhauling the state's child support system, which affects about 300,000 children in the state. Bills that would base child support on the combined income of both parents are picking up momentum. While nearly everyone involved in the debate agrees that the current system needs reform, there's little consensus on the best way to do that. St. Paul, Minn. — Thirty-seven states calculate child support using the income of both parents. Minnesota isn't one of them. It considers only the income of the parent who doesn't have primary custody of the child, which is usually the dad. Sen. Tom Neuville, R-Northfield, says basing child support on the income of both parents is more fair, and would lead to fewer custody battles in the courts. "A divorce starts out and right away the father starts to contest custody, when all he really wants, is he wants a little more time, and he wants to pay a little less money," according to Neuville. Neuville says his bill would give parents who don't have custody a reduction in their child support payments if they spend time with their kids. And by switching to a system where both parents' incomes are considered, Neuville's bill is expected to reduce child support payments for parents with one child, and increase payments for parents with two or more children. "The bottom line is: the kids are the ones that lose," says Michele del Castillo, a co-leader of the Twin Cities chapter of ACES, the Association for Children for Enforcement of Support. Castillo is a divorced parent of four whose ex-husband owes more than $100,000 in back child support payments. Castillo says the current guidelines don't adequately meet the needs of children, and changing them will create only the appearance of fairness. "And actually I think it's more semantics than anything else. I think there's a greater concern of having it appear to be that if I have to pay, so does she," Castillo says. Castillo says that argument fails to recognize that custodial parents already face many expenses to provide for their children's daily needs, and also have the added pressure of caring for their children most or all of the time. Critics say the current system fails to recognize that non-custodial parents have expenses too, and they need to be able to provide a decent home for their children when they're with them. Kevin Hoppe of St. Francis is a divorced father of three who lost his job three years ago. He says the court refused to lower his child support payments, which totaled more than $1,500 a month. He says he couldn't afford to do anything with his kids that cost money. "If we went out to a park and had a picnic, that was a big outing for us; McDonald's was a huge outing for us," says Hoppe. "The system is very flawed. It makes it almost impossible for the non-custodial parent to function with the children, and the children see that." But while Hoppe supports a change in the system, he doesn't like the bills making their way through the Legislature. He says they use an inflated estimate of how much it costs to raise a child, and take into account parents' gross income, instead of the net income that they actually take home. Still, Hoppe and other observers think it's likely the Legislature will finally change the system this year. The House has twice passed bills that would consider both parents' incomes, but they've stalled in the Senate. 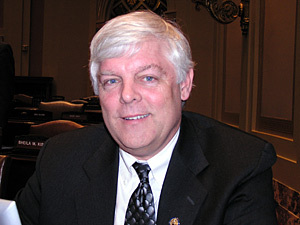 This session, the senator credited with blocking previous attempts, DFLer Linda Berglin of Minneapolis, has reluctantly agreed to support Sen. Tom Neuville's bill after the two agreed on compromise language. "I still wish the bill were better. But it's better than it was, so I consider it a compromise," Berglin says. Berglin says she's concerned that many moms will get lower child support payments, because Neuville's bill would allow a deduction for parenting time and a deduction for noncustodial parents' - usually dads' - other children. But Berglin does support the idea of taking both parents' income into account when setting child support. "There always will be, without it, cases where the custodial parent earns 10 times as much as the noncustodial parent, and he's looking at it and saying, 'I don't hardly have enough to get by on, and she doesn't really need all this money to support these children,'" Berglin says. But Berglin points out that those cases are rare, and she worries about the custodial parents who currently get little -- if any -- child support. She also notes that most legislators don't understand the issue, so it's difficult to have a productive debate on the subject. Both Neuville and the House sponsor, Republican Steve Smith of Mound, are family law attorneys familiar with the system. While their two bills have significant differences, Neuville says he's confident they can be resolved if the bills are passed by the Legislature this year.